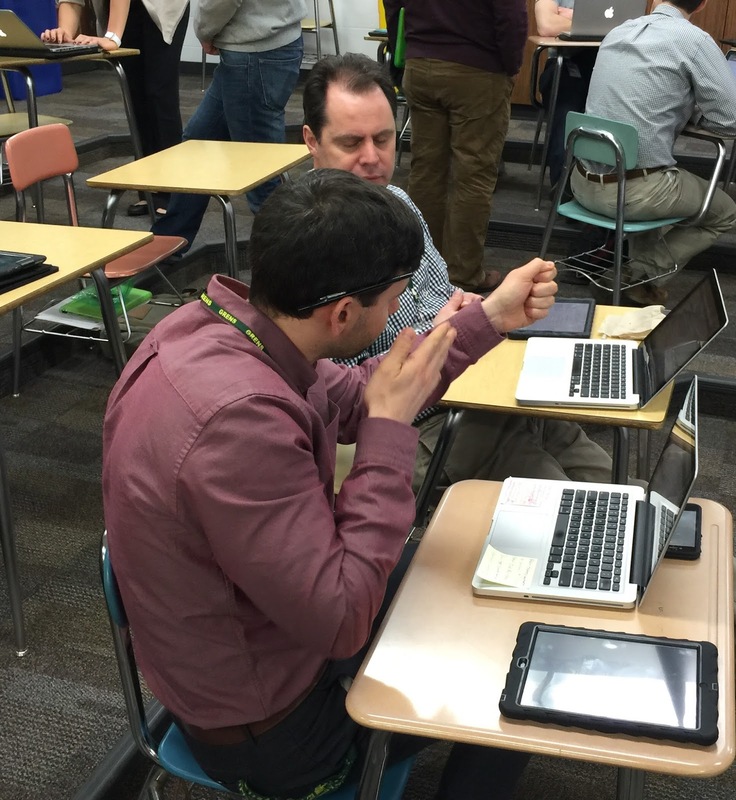 The Collab Blog: Building Professional Learning Networks at Elk Grove High School and Beyond! 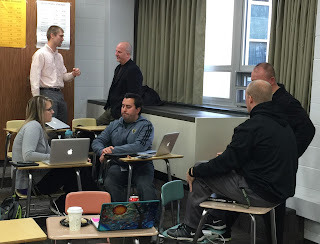 Building Professional Learning Networks at Elk Grove High School and Beyond! 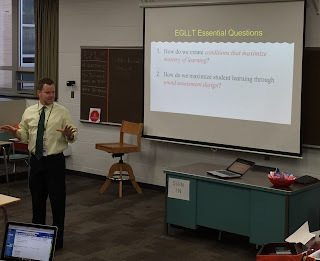 5th in a series of monthly Professional Learning workshops on focused on Assessment Literacy. 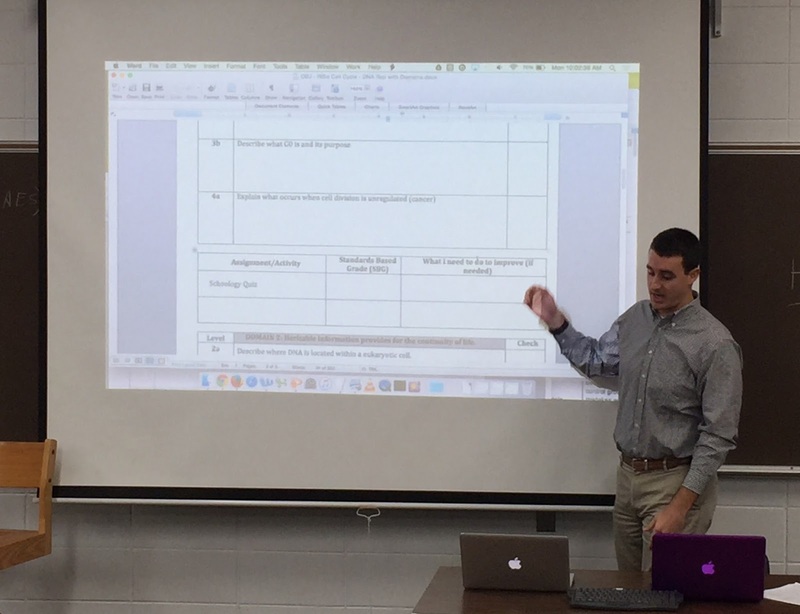 Today's session focused on establishing and communicating clear learning targets. 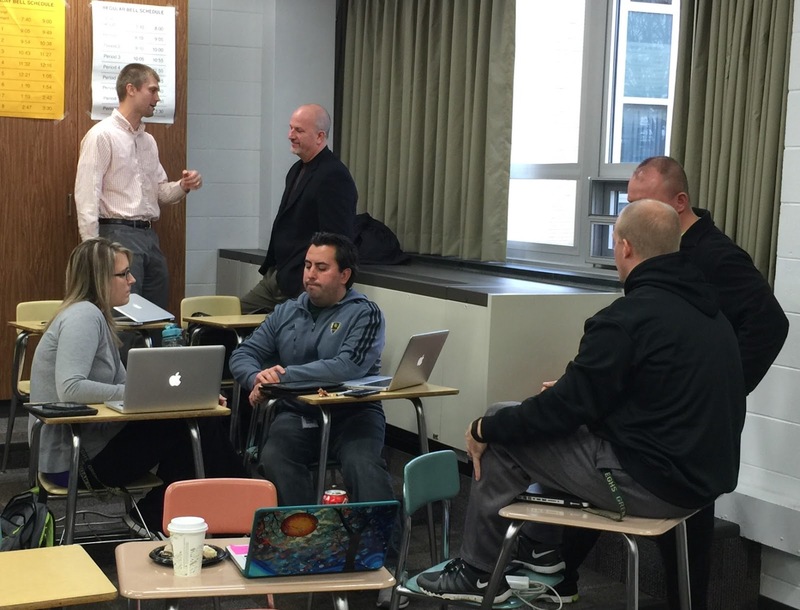 Professional learning characterized by examining research-based learning strategies, sharing examples and models of work from our own practice, and planning next steps to improve our practice to impact student learning. When: 8:00 a.m - 12:00 p.m.
Today's EGLLT workshop followed the format that characterizes all of our EGLLT professional learning meetings. Activating our background knowledge (from previous sessions and teaching experience), building background knowledge (often by reading and processing a research-based professional reading), sharing examples of our practice (with the whole group and in small groups), reflecting on and self-assessing our practice, and planning next steps for our instruction. The focus of today's session was on establishing and communicating clear learning targets. Establishing clear learning targets allows us to align our instruction, our assessments (both formative and summative), and feedback to students, thereby impacting student mastery of essential learning in our courses. It also fosters students motivation, engagement, and ownership of their own learning. I left EGLLT today feeling inspired and energized, once again, by the interdisciplinary collaboration, conversations, and examples we shared. 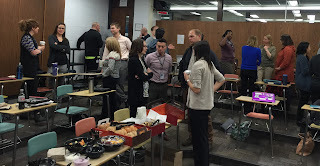 And, it was great to expand our learning networks beyond Elk Grove High School with participation from from 5 Grove Jr. High School staff and 2 colleagues District 214 colleagues. Principal Paul Kelly starts us off! Sharing our Essential Questions that drive all of our learning for the year, and sharing examples of the impact on student learning. Our unprecedented Freshman success rate is just one example! Activating Background knowledge from our previous EGLLT meeting. 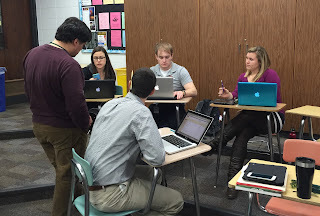 Interdisciplinary groups coach each other to demonstrate learning of key concepts. Learning from peer examples / models of work: Quinn Loch shares "I used to . . . " "Now I . . . " and "What I noticed as a result . . ." related to the progress of his science PLC with communicating clear learning targets. Learning from peer examples / models of work: Mark Heintz shares the progress of the Human Geography team in establishing clear learning targets and aligning the targets to instruction and assessments. 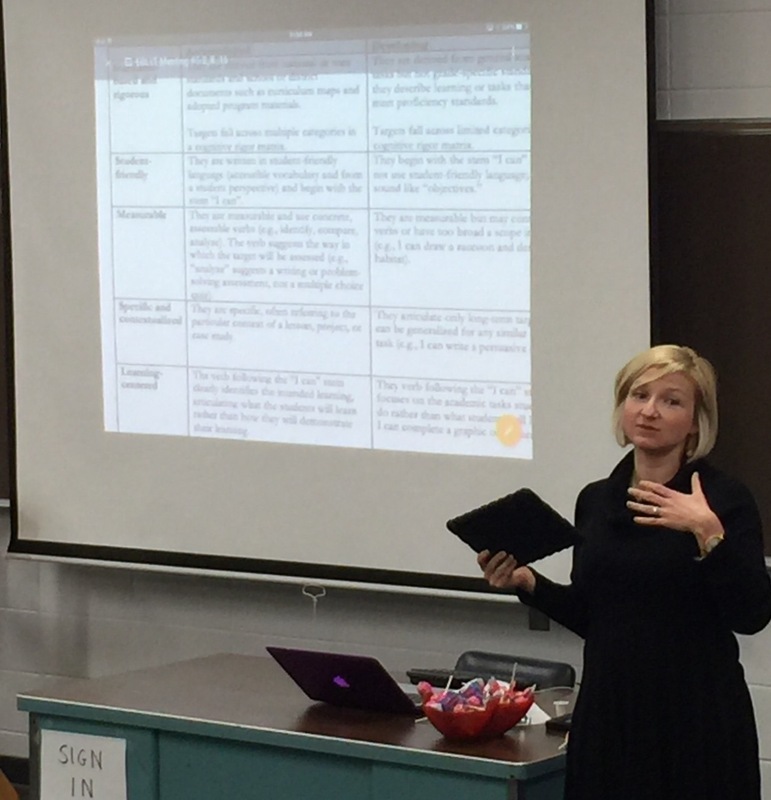 Learning from peer examples / models of work: Colleen Mullaney shares examples of her practice from several years ago, and several steps that reflect modifications in her communication of learning targets to engage students more in their own learning. 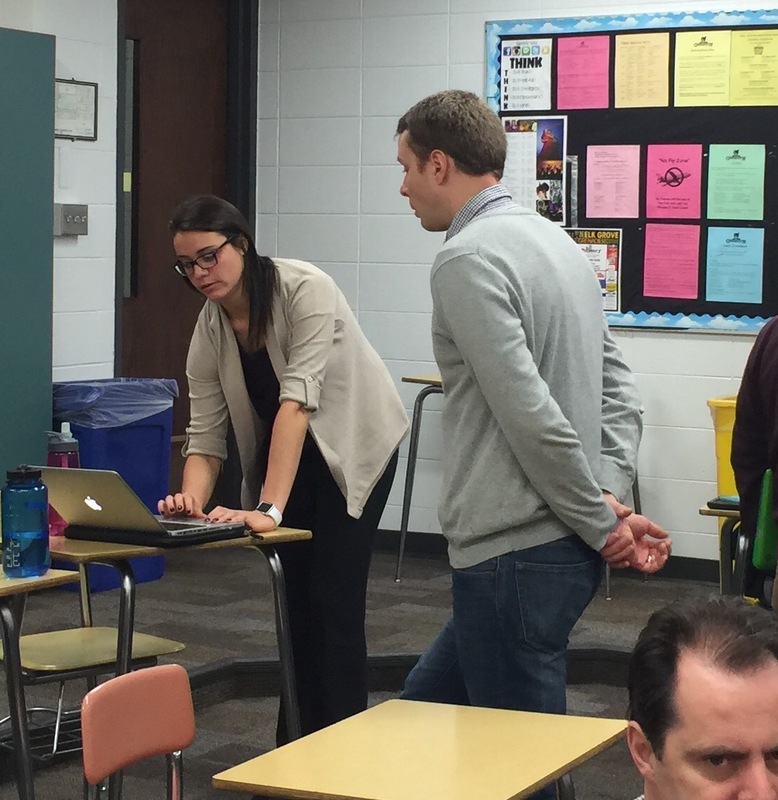 Associate Principal Megan Knight prepares staff for a self-assessment activity. After sharing peer examples, examining models of learning targets, and engaging in an activity to distinguish between learning targets and activities, we prepared to examine our own learning targets and determine next steps to improve our communication of clear learning targets to our students and to align our instruction and our feedback to students in order to improve student mastery of essential learning in our courses. 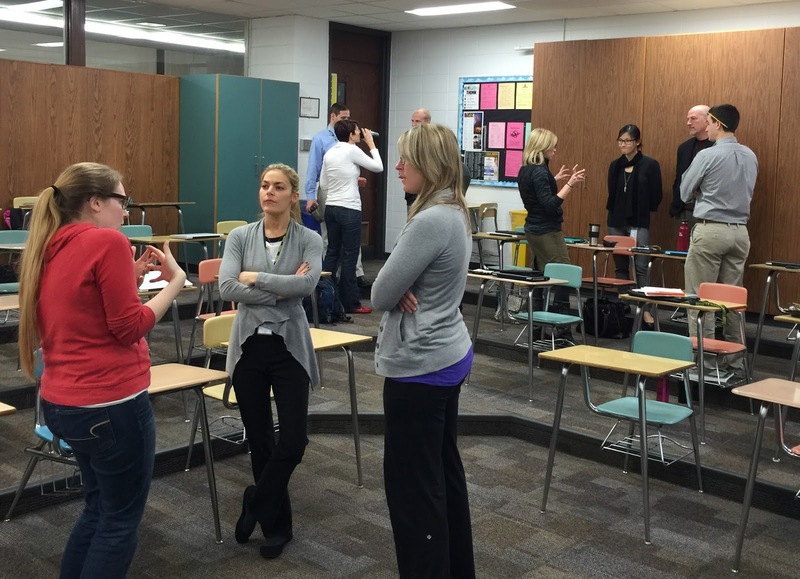 Intradisciplinary, interdisciplinary and cross-school collaboration: A division chair from Math/Science and a psychology teacher; our Elk Grove Health teachers; and a PE teacher from Elk Grove High School and Grove Jr. High School reflect on their practice. 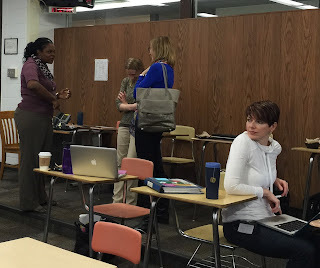 The Math / Science team reflects on their practice and plans next steps. 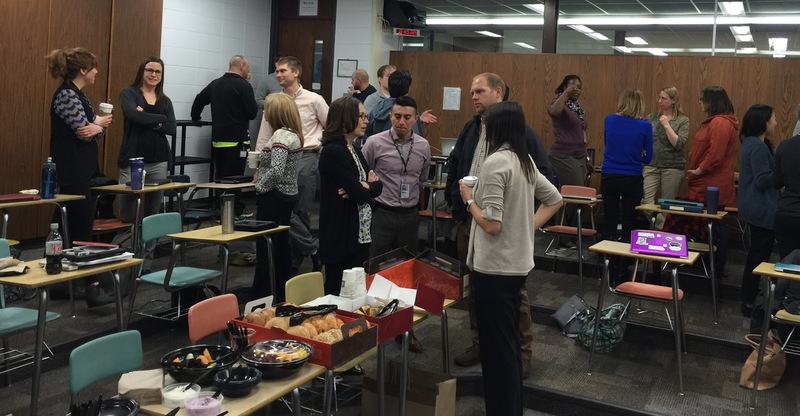 Elk Grove High School and Grove Jr. High School reflect on their practice and share ideas to continue their collaboration across schools! 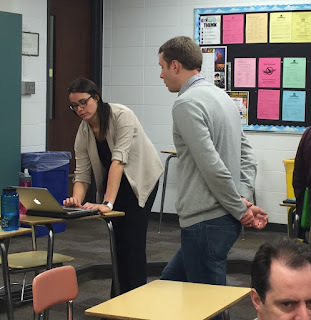 Social Science Division Chair and teacher brainstorm ideas to "break down" the learning targets and scaffold instruction to engage students with the essential learning in their courses. 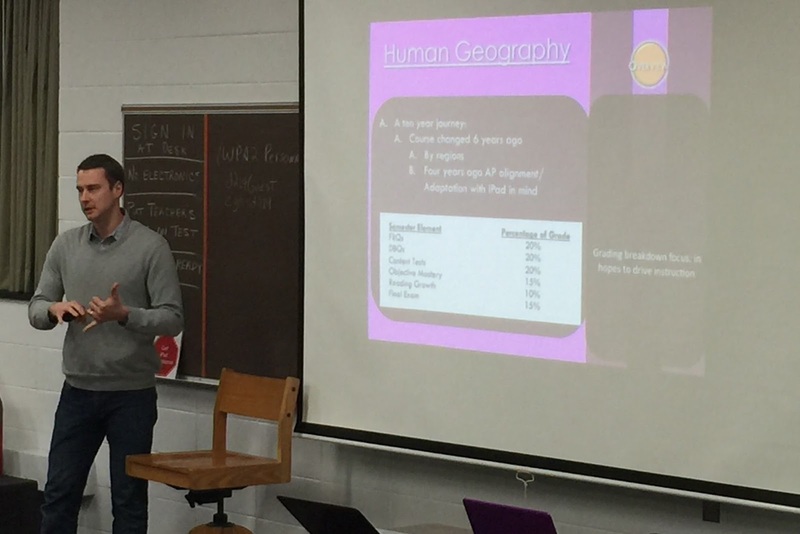 Human Geography Teachers take next steps with instructional design and assessment. When I look back at the photos from the day, I can't help be inspired by the sharing and collaboration and learning with my colleagues. For more details about the Essential Questions that drive our learning, and the specific learning targets and activities for EGLLT 5, check out our slide presentation: EGLLT #5 Clear Learning Targets.